Art Basel Hong Kong (29-31 March) is now a firm fixture on Asia’s art calendar. Here’s a rundown of the highlights to see during Art Basel Hong Kong. Persue launches “Wet Paint” exhibition in Tokyo’s Basement Ginza. Ahead of Gallery Weekend Beijing, a run-down of the best exhibitions in China’s capital. Asia’s most innovative and interesting institutions from Hong Kong to Japan. Amid a gloomy economic forecast and political tensions, Art Dubai tries to find stability. Sharjah Biennial 14 is raising the emirate’s cultural cachet. Venice to launch permanent Giudecca art district at Biennale. All of the artists in the 58th Venice Biennale opening in May. These galleries have the most artists in the Venice Biennale. A rash of gallery closures has plagued Berlin, but a new crop of dealers may have a solution. New contemporary art space opens in impoverished area outside Tunis. London’s Art Night 2019 promises to be star-studded. Tate will not accept further donations from Sackler family. London art dealers are hatching emergency plans to ship art abroad amid Brexit plans. Meet the art SWAT team that keeps fakes out of Europe’s fanciest art fair. Here are 2018’s most visited shows and museums. SFMOMA announces public unveiling on May 23rd of major installation by artist JR.
Kehinde Wiley launches artist residency program in Senegal. Demanding deeper thinking, in tribute to Okwui Enwezor. The sitting targets of painter Lucian Freud. Why Manet’s masterpiece has confounded historians for over a century. The many styles of Pritzker Prize winner Japanese architect Arata Isozaki. The Bauhaus has shaped our world for 100 years. New prize will award unprecedented $1 million to artists to help realize an ambitious project. The dealer using Instagram as an auction house. A new app lets users explore art galleries in virtual 3D. Emma Kunz, the researcher who refused to become a guru. Christchurch shooting gives new sense of urgency to Simon Denny show. 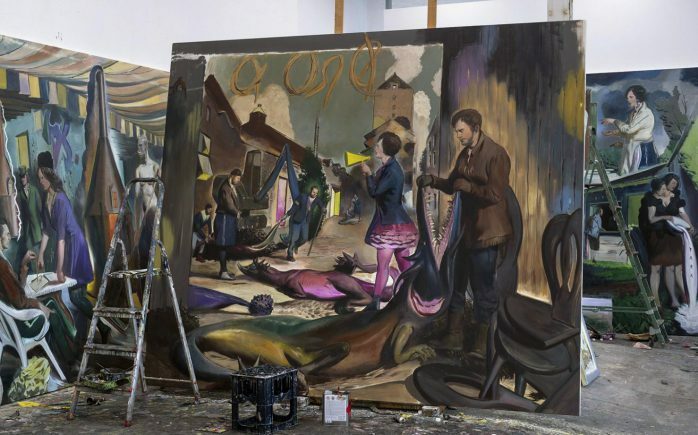 Painter Cy Gavin’s transhistorical reckoning at Gavin Brown’s enterprise, New York. Gabriel Rico’s first ever US exhibition investigates the relationship between humans & nature. The daily routines of 10 women artists, from Joan Mitchell to Diane Arbus. The collecting couple who became sleuths of photographic forgery. These photographers captured the fearless youth of the 1970s. New MoMA art supplies help kids find their inner artist. How to turn your vacation into an artistic retreat. More than 2,500 New York City subway cars are now artificial underwater reefs. Why art colleges and universities should not act like for-profit galleries. 7 things artists should know before filing taxes. How artworks get their prices and how experts determine value. Late Tang Dynasty sculpture bought at a garage sale for under $100 just sold for $2.1 million.